From the author of the bestselling Blood books, a brilliant new tale of shape-changers, mages, soothsayers, and a power-mad emperor. I pretty much had to restrain myself from throwing a Breakfast Club style fist pump while reading this book, so yes, I loved it. 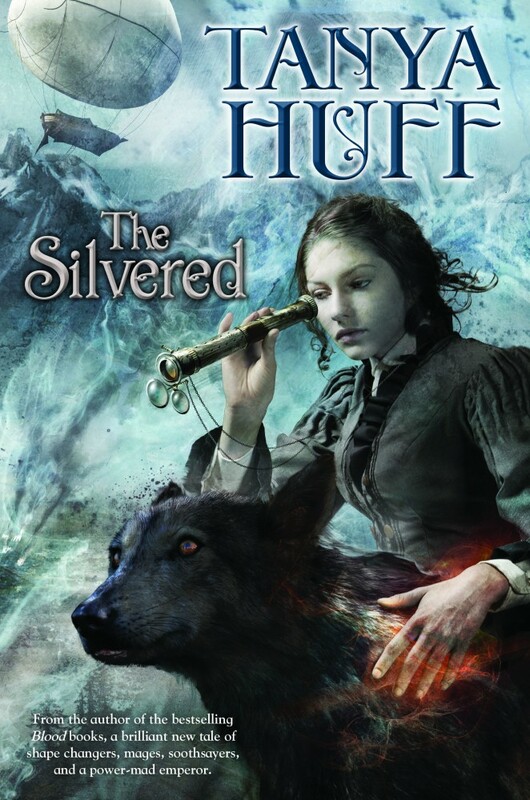 Oh, Tanya Huff, welcome, welcome back to high fantasy – please, pull up a chair and stay awhile. Now it’s not that I haven’t been enjoying Huff’s sojourns through military sci-fi and urban fantasy, it’s just that this book is a brilliant example of old school high fantasy adventure, which is exactly what I’ve been missing from my reading palette. Party I think due to the fact that we’re seeing a continuing outbreak of Game of Thrones syndrome – dark, gritty fantasy is very much The Thing these days – but also I think because this style of high fantasy tends to get shimmied into the YA category these days, and often in the process gets aged down and/or stamped with that genre’s sins for marketability purposes (yes, insta-love, I’m looking at you). But whatever the reason, lately it’s seemed that non-terminally-depressing hero’s-questing-style high fantasy has become a rare beast – but happily this book is EXACTLY that, with a fully realized world, detailed yet never overwhelming, and a lean, mean narrative focused on two youngsters venturing deep behind enemy lines on a rescue mission. And man oh man did I love it. I hardly know where to start – but let’s start with the world. Napoleonic in flavor, we have an encroaching Empire bearing down on a small country, with magic and science squaring off, and werewolves to boot. Now I can guess what you’re thinking – yes, we’ve all read many a werewolf story of late – but I enjoyed Huff’s take on the classic paradigm very much, particularly in terms of how she wrapped the usual (shapeshifting, pack order, etc) up in nobility, politics, and warfare. The pack is an intrinsic part of the social fabric of Aydori, and it was very fun to see their rules and practices play out across society at large, impacting everything from wardrobe to courting. So yes, the world-building is as large in scope as you could wish, but with just the right amount of detail to fill out the picture – and all in all it was very well done. As for the characters, there are a slew of them, to be sure, but they all quickly became clear to me. Mirian is the main focus of this story, and she definitely has, as they say, gumption. It’s very fun to watch her stubborn practicality bear down on the impossible mission she’s assigned herself, and the development of her magic is equally fascinating – and I LOVED the price Huff associates with a mage’s powers. As for Tomas, Mirian’s foil, he’s a fairly straightforward kind of lad, but I really liked how his naivete and youth played out against his growing wartime experiences, and how he and Mirian regularly clashed over who was in charge. Now yes, it’s a rather classic dynamic for a duo – ye old bumping heads – but it was highly enjoyable in this case, particularly as Huff quickly develops and deepens their comradeship, all the while nimbly skirting any romantic notions to focus on the matter at hand, namely the fact that these two kids are deep inside enemy territory. Now I’m not going to get into the plot, so as not to spoil anything, but I will say this: it’s super clean (and by that I mean in form, not content), and it works, top to bottom. Now yes, the bad guy is admittedly a little broad – he rates pretty high on the Really Evil Psychopath scale – but he serves the story well in terms of providing both chilling brutality and an utter lack of predictability, and I was definitely rooting for his downfall. All in all, I just was fully caught up in this story from the start, and I barreled through it until the end. And while I will say I thought the ending petered out a bit, instead of ending with a bang – there was a denouement kind of feel to the last chapter or so, and it felt a hair anticlimactic – all in all I was very, very happy with this book. A hero’s quest, youngsters coming into their own and learning what they’re capable of, a country’s fate hanging in the balance – oh come on, how can you not love it? ‘Cause wow did I ever – and now I’m seriously hoping there are more books to come. The way that Huff tied all of the strings together from this epic journey was masterful. She paid equal attention to her characters as she did her world-building resulting in a seamless whole. The melding of science, magic, era-specific technology, superstition, war and how ordinary people can do extraordinary things was captivating. Once again Huff succeeded in making the world around me vanish for several hours.